Anders Ditlev Clausager has set us a real challenge here. 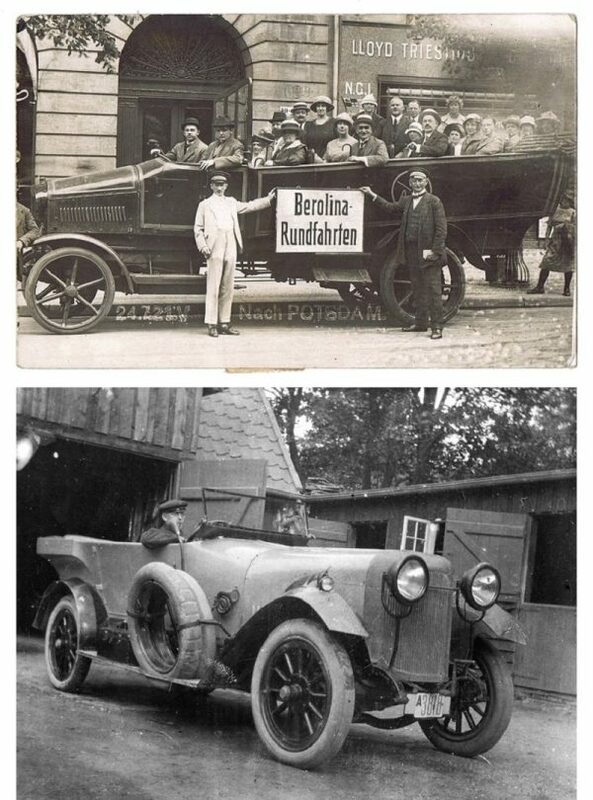 These two pictures came to him from the editor of the magazine of the Danish Veteran Car Club. They are their recent “puzzle pictures” but no-one has been able to completely identify them. Both are German, so Anders has also tried our German friends at the AHG (Automobilhistorische Gesellschaft) – and they have not been able to help conclusively either. The open bus or “charabanc” was photographed outside 49 Unter den Linden in Berlin on 24 July 1921 – see the date stamp on the photo – apparently about to take a party of happy day trippers to Potsdam. Oddly, the Berolina bus company’s home page says that this company was only founded in 1929. We guess that the bus is a re-bodied World War One German Army truck; the cast-iron or cast-steel spoke wheels with solid tyres and chain drive are typical for these Army trucks, but there were apparently anything up to 50 companies who made such vehicles. They were known as Subventions-LKW (Subsidised trucks), and were built between 1908 and 1913 with financial help from the German army, on condition that they could be requisitioned by them in the event of war. But which of these many companies made this one? The large open touring car was photographed in Denmark around 1920. The tulip-type body and pointed radiator are typical German, and the body has been identified as the work of the Berlin coachbuilder Alexis Kellner, circa 1913 (or perhaps later). The unusual boxed-in well for the lowered hood was the subject of a patent taken out by them (and was copied on the Austin Twenty in 1919). Our original guess of a Stoewer has (almost) been disproved – and we now suspect that the radiator is a later home-made addition. Can anyone identify the car? Sorry for the tardy response, but other things came in the way. But as apparently nobody else is daring to take a jump, I decided to sent in this reaction after all. Maybe the easiest is the touring car, which is indeed a Kellner body. In appearance it is quite similar to their ‘St. Petersburg’ model. The radiator seems to have been part of the design and was only a shell with the real radiator hidden inside. Kellner had the skills to almost completely disguise the original make, but on the basis of several chassis details my idea is that the chassis in this case came from Benz. The bus is more difficult to identify. Indeed many commercial cars were rebodied war trucks, but new products came surprisingly fast, also in Germany. In this case I guess it could be a new one and the make possibly a Mannesmann-Mulag. What puzzles me however is the “wrong way” direction of the louvres in the bonnet.